Imagine colorful balloons entering your door as you eagerly prepare lesson plans for the weeks to come! One would think that I was being visited by the Publishers Clearing House Prize Patrol with the excitement beaming across the face of my principal, Chad Jewett. That’s what I experienced yesterday as members of the Johnston County Education Foundation walked through my classroom door with colorful balloons and a check written in my name. 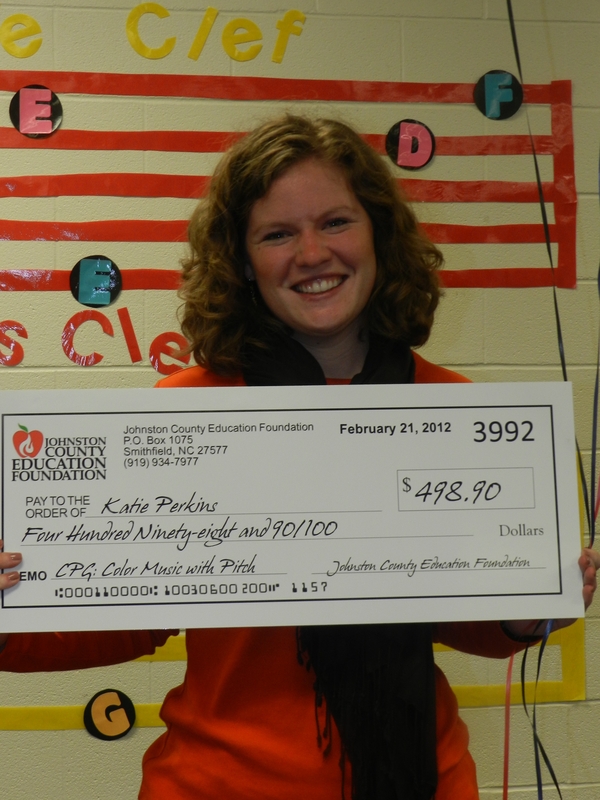 My name is Katie Perkins, and I graduated from Meredith in 2009 with a Bachelor of Music in Music Education. In July of 2009, I began my teaching career at West Smithfield Elementary School teaching general music and chorus to kindergarten through 5th grade students. 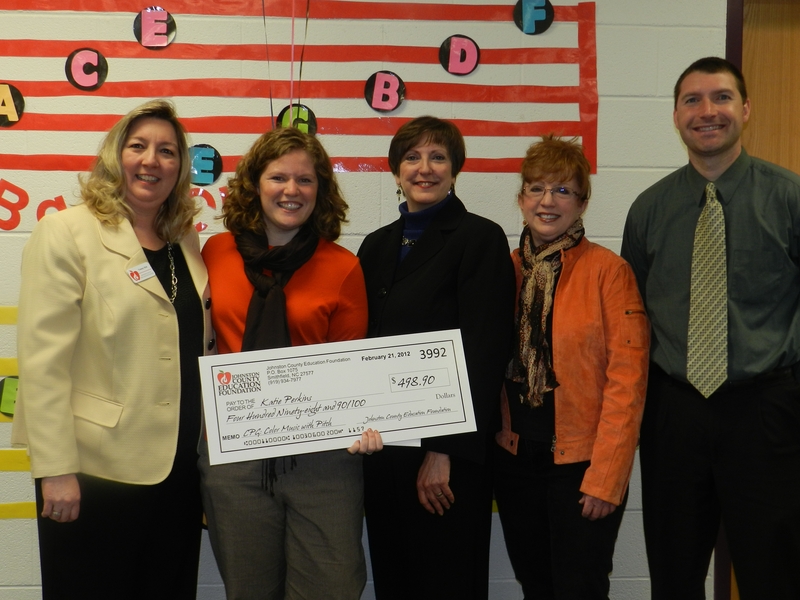 I have worked diligently to build the music program over the years, so in November of 2011 I wrote my first grant titled “Color Music with Pitch” in hopes of being one of the lucky recipients of a check for up to $500.00 for funding a project in my classroom. The application was judged by former educators and community leaders based on the following criteria: (1) Creativity, defined as a novel idea, a new way of looking at an old idea, or a lesson that will bring out creativity in the students, (2) Benefit to students, (3) Ability for the project to continue after the funds are depleted, (4) Potential to motivate the students in their studies, (5) Cost-effectiveness, (6) Alignment with curriculum, (7) Methods used to evaluate project effectiveness. Through this experience, I was reminded of why I chose to become an educator. Despite the economic downfall, foundations still care about supporting classrooms to influence the education of our students. I was also reminded of the influence that education has had on my career as an educator. Through my education at Meredith, I gained the confidence to be persistent in what I feel is right as an educator and learned to push for whatever materials and support are needed for the success of my students. I also acknowledge the opportunities to be involved in traditions at Meredith, such as Cornhuskin’ and Stunt, which broadened my creativity of various activities in the classroom. What has made this entire opportunity so special is that the grant will benefit over 600 students and that in my heart I know that Meredith College is a contributor to the influence of music in the lives of every child I teach. Thank you, Meredith College, for influencing the melody of the song I help write in the hearts of the students that enter my classroom.